NextDayScience serves industrial, government, pharmaceutical, educational, and life science industries. The company provides laboratory consumables, research equipment, digital imaging, and microscopy products to customers around the world. The flasks and storage bottles that NextDayScience carries are made ofborosilicate glass. They have very low thermal expansion coefficients, which make them resistant to thermal shock. The glassware handles thermal stress better than conventional glass. Borosilicate glass is made by combining and melting alumina, soda ash, silica sand, and boric oxide. New technologies were required for industrial production. Different methods used in the manufacturing include moulding, tube drawing, and floating. The method used depends on the geometry of the product. The flasks available from NextDaySciencehave baffled or flat bases. Filtering flasks have a bolt neck and side tubulation. Flasks used for filtering are designed to be a combination of physical strength and shock resistance. The storage bottles are reusable. They can endure temperatures from -70° C to 500° C.
Graduated cylinders are used for precise liquid volume measurement. They are narrower than beakers and measure more accurately. Graduated cylinders, made of plastic, offer shatterproof durability. NextDayScience has an assortment of plastic graduated cylinders from which to choose. The cylinders meet a standard of quality and superior performance for valuable research that requires the highest material quality for dependable performance. Because plastic cylinders are shatterproof, they are less likely to lose valuable contents or cause injury. Plastic cylinders are easier to handle and lighter in weight than glass, making them more ergonomic. There are no sharp edges or chipping with plastic graduated cylinders. Bench space is often limited in busy labs. Knocks and bumps are nearly unavoidable. Glass graduated cylinders are prone to cracks or chips and shattering on impact. Fragile glassware poses daily risks. The products listed under the category of Spreaders on the NextDayScience website include inoculating loops and needles, as well as spreaders. An inoculating loop is a simple tool that is used mostly by microbiologists to retrieve inoculum form microorganism cultures. The inoculating loops and needles available from NexDayScience are used for bacterial inoculation, serial dilutions, urine counts, and sampling. They come pre-sterilized and are meant to be used only once to eliminate the risk of cross-contamination and the need for flaming sterilization. The hexagonal shape of the shafts makes guiding, orienting and gripping easier. They are a time-saving, cost-effective, and efficient alternative to metallic loops and needles. Spreaders are available in T-. L-and Triangle shape. The triangular spreaders come in a small and large size. The edges are rounded to prevent gouging, scraping, or cutting of agar during inoculation. Unless a glass beaker is filled with highly reactive chemicals, heated too fast, or dropped, it will last indefinitely. There are some rapidly expanding choices in plastic ware for scientific laboratories. Advances in synthetic technology have caused new plastics to push into a formerly glass-dominated domain. Scientists choose labware based on personal preference and specific applications. The beaker remains the primary vessel used in today's labs. Beakers are now available in materials that have reduced the need for glass beakers. 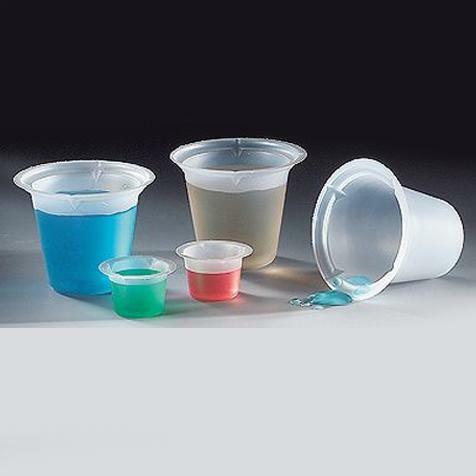 NextDayScience has beakers made of polymathic pentene, polypropylene, and polystyrene that feature graduations in ounces and millimetres and have dripless spouts. They are unbreakable and can be used with common alkalis, solvents, and acids. The beakers can be autoclaved. They are reusable but inexpensive enough to be recycled.